The Crested Butte Titans boys basketball team switched things up this year to open the regular season. 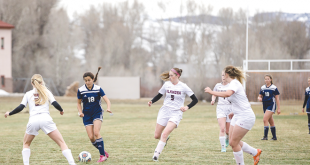 Typically they head to Leadville for a tournament but coach Brandin Hamilton opted for a different plan, taking his team in the opposite direction for two games in Grand Junction against Caprock Academy and Plateau Valley. The Titans were primed for a strong showing in the first weekend with solid workouts but as game day approached, players started dropping from the roster for a variety of reasons and Hamilton was left with eight out of 12 players from his varsity roster, forcing him to pull up a JV player to add a little depth to the bench. “We had to make some last-minute adjustments but I was still confident going into the weekend,” says Hamilton. 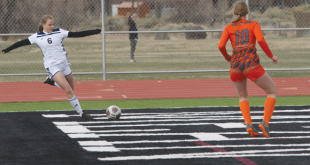 The Titans opened the season against Caprock Academy on Friday, November 30 and after a slow start, started to find their groove as the game wore on. “It took a while for us to warm up but the game went pretty much according to plan,” says Hamilton. Prior to the tip-off it was evident that Caprock had a significant height advantage and so Hamilton immediately impressed upon his team to keep the pressure high and prevent Caprock from establishing any semblance of a half-court offense. The Titans sputtered early but still built a 7-2 lead after one quarter and then started to open things up in the second quarter, going into halftime with a 19-6 lead. “We pressured them and started to force mistakes,” says Hamilton. The Titans maintained pressure on Caprock throughout the second half, setting the tone for the remainder of the game to take the 50-26 win. “We were forcing turnovers and were able to capitalize on them and slowly pulled away,” says Hamilton. Jovany Aguirre led the team with 13 points, including four three-pointers, followed by Ethan Bacani with 11 points and Eric Wasinger with nine, while Tommy Linehan proved a force in the paint, leading the team in rebounds. Crested Butte returned to the court on Saturday, December 1 to face Plateau Valley and were again facing a size disadvantage but with more talent as well. “We were basically playing a much better version of Caprock and they looked to just pound the ball inside,” says Hamilton. The Titans’ short bench got shorter two minutes into the game as they lost one of their big men to injury and Plateau Valley built a quick 7-0 lead, closing the first quarter up 15-5. “We had a terrible start and dug ourselves a hole,” says Hamilton. Hamilton switched things up in the second quarter, moving to a full-court zone press and the Titans started to claw their way back into the game, pulling to within three points by halftime. While the Titans’ efforts provided plenty of opportunity to take over the game, one final ingredient was missing: shooting. “We were ice-cold shooting,” says Hamilton. The Titans were just one point back heading into the third quarter but Plateau Valley’s star player caught fire again and knocked down three quick buckets in a row. Meanwhile, the Titans’ shooting woes continued and they eventually fell 44-36. Wasinger led the Titans with 12 points, with Aguirre dropping in eight and Linehan still leading the team on the boards. Overall, Hamilton saw a team that can make things happen if they can knock down shots and keep the pressure on. The Titans will host their first home game of the season this Friday, December 7 when they host the Ouray Trojans, a team they haven’t seen in years. “They’re tough. They’re always tough,” says Hamilton. Tip-off for the JV is at 4 p.m. with the boys varsity starting at 7 p.m.